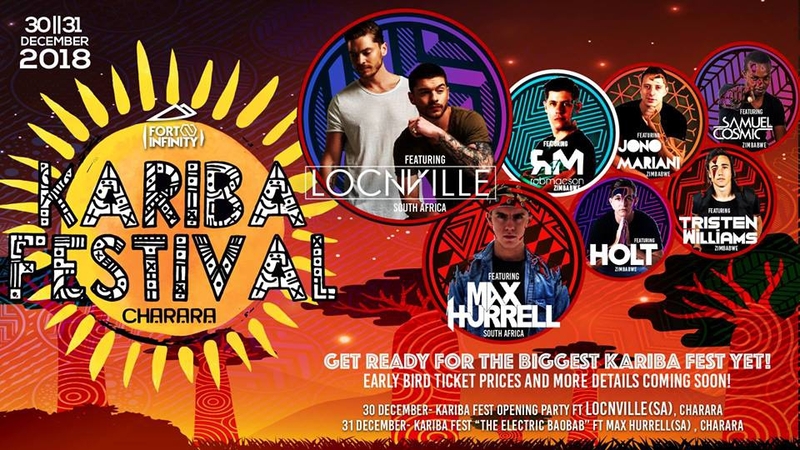 Kariba Fest 2018 ft Locnville, Max Hurrell & More! Locnville-Multi-award winning and chart-topping twin brothers Locnville have achieved massive success in their home territory, South Africa. And more recently spent time in LA to work with international musicians on new content and are sure to set Kariba Fest alight as one of this year's headliners! Max Hurrell- South African DJ/Producer Max Hurrell has seen a fast rise into the spotlight with a number 1 single on major radio stations in South Africa as well as multiple high profile headline slots such as Rocking the Daisies & Durban Rage! Max is ready to bring his high energy performance to Kariba Fest, the only question is if you are ready for it!? On top of these amazing artists, we also have some of Harare's finest DJ's- Rob Macson, Holt Music, Samuel Cosmic, Jono Mariani & Tristen Williams! This year's edition also features improvements such as a massive new stage, A VIP area and so much more! Keep an eye on our page for other exciting details and ticket release dates! ARE YOU READY FOR THE BIGGEST KARIBA FEST YET?